Technicians and demonstrators have a valuable role in supporting the student learning experience within psychology departments. In recognition of this the Higher Education Academy Psychology Network (News Link), in collaboration with the Association for Technical Staff in Psychology, ATSIP, sponsor an annual award for a technician or demonstrator who has provided outstanding support for the student learning experience in their department. "I have been teaching psychology since completing my undergraduate degree in 2003, I am still just as in love with the subject and I am passionate about teaching statistics and research methods which I see as the core of psychology degrees. I was delighted to be nominated by staff and students and to receive this award from the HEA is fantastic. I am always looking for ways in which I can introduce innovative approaches to teaching and research and it is excellent to be recognised for this." Since starting her role as Psychology Demonstrator at Oxford Brookes University in September 2009 Emma has worked tirelessly as a demonstrator providing outstanding support for the student learning experience in the department. Emma is passionate about psychology and about supporting staff and student development. 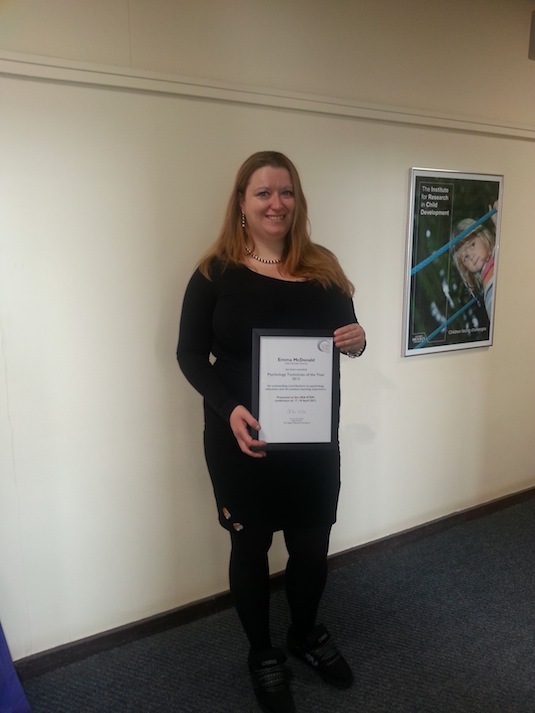 The majority of Emma's time is spent teaching psychology practical seminars and one-to-one support for students. Emma has been developing and refining her teaching since 2009, she has also been able to develop the content for her modules, for example introducing more formative feedback to enhance the student experience of the research methods modules. The students receive weekly tasks and feedback so they can track their progress. This also allows teaching staff to adapt their teaching to address weakness promptly. Recently Emma has added an addition section to the online formative tasks, which allow students to give the demonstrators feedback on their sessions. This has allowed the demonstrators to improve their dialogue with students and to respond quickly to any concerns flagged. This direct feedback has contributed to a programme of continuous improvement, allowing demonstrators to ensure that the pace of the session fits with student learning needs. This has also engaged students in shaping their learning experience on a weekly basis. Emma also wants to pass on this passion for teaching providing support for PhD students who have wanted to gain teaching experience. She works with the PhD students to find a mutually beneficial way for them to get experience, without having a negative impact on their own research and studies. She has given workshops to small group at the HEA postgrads who teach events. Emma is proactive in finding ways to help students develop their passion for psychology. She assisted 3rd year students develop poster presentations from their work that were accepted for and displayed at the BPS Annual conference. This support included finding assistance with funding for the students and attending the conference to support the students when presenting their posters. She also encourages students to write for publications such as Psych-Talk the magazine for the Student Members of the British Psychological Society. Emma also interested in researching the teaching and learning of statistics at university. Statistics is at the core of most psychology research methods courses and forms a substantial component of accredited psychology degrees. However, teaching statistics has also been described as one of the biggest challenges in teaching psychology in the UK, it is often considered 'troublesome knowledge' by staff and students alike. She is particularly interested in looking at ways make the topic more pleasurable for both staff and students while improving theoretical understanding. Outside of her role of Psychology Demonstrator Emma is committed to engaging with the wider public and promoting psychology and science. She is an active member of the local branch of the BPS and spent 2 years as Chair. She founded the 'Psychologist in the Pub' events, where researchers will give talks about their work in local pubs. Emma also helps organise and publicise 'Sceptics in the Pub' and 'TEDx Oxford', which are talks on much broader topics. These events are well attended by psychologists in the area, as well as our students and members of the general public. It also provides the opportunity for networking in an informal and relaxed setting.